When it comes to choosing the right lamp shades for the lamps in our homes, a lot of us probably don’t know where to start — or that there was such thing as choosing a “right” lamp shade in the first place. Well, we’re here to tell you that not all lamp shades are created equal, and you should put forth some intentional thought when deciding on which ones you want to include in the rooms of your home. 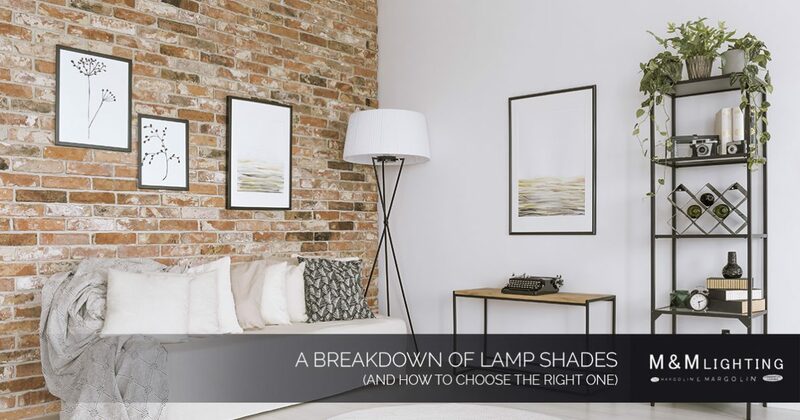 In this blog post, we’ll break down lamp shades and how you can choose the right ones for your home, based on your interior design goals and desired purpose of functionality. At M&M Lighting, we’re proud to be one of the top suppliers of interior lights in Houston, and we only offer lighting products (including lamps and lamp shades) from brands we know and trust. If you need help finding ideal lighting solutions for your home or office, schedule an appointment with one of our experienced lighting experts today. Continue reading for some assistance on choosing the perfect lamp shades for your home! Which one should you choose? Well, this part comes down to your personal style preference and the shape and style of your lamp base. For example, drum shades look best on tall, cylindrical lamps whereas square-shaped bases look best with rounder lamp shades. Use your best judgment, or ask one of our lighting experts when in doubt! Next, you’ll want to determine the size and color of your lamp shade. We recommend using this general rule of thumb when it comes to size: Choose a lamp shade that is about double the width of the lamp base. It should also account for about 40 percent of the overall lamp height. You can make the lamp a main focal point of the room if you’d like. You can get creative with the colors and mix and match as you please. Softer textures are best for a more traditional look. Smoother shades are best for our modern/contemporary-prone customers. Burlap, silk and paper textures are all really trendy lamp shade textures these days. Now that you know where to start, you probably need a place to browse and shop for lamps and lamp shades that will look great in your home. We’re sure you’ll find something (or many things) you absolutely adore in our Houston lighting store! At M&M Lighting, we’re proud to say we’ve been serving the Houston community for more than 50 years, and our lighting consultants are best known for their expertise, knowledge and unrivaled customer service. Shop lamps today. For more information, feel free to stop by our Houston lighting showroom. If you can’t make it in, you can call us at (713) 469-3002 or fill out our online form, and we’ll respond as quickly as we can!